During warm August days most songbirds are quiet. They are molting and stay hidden from potential enemies. But the eastern wood-pewee drawls his plaintive “pee-ah-wee” song. He, it turns out, doesn’t molt until after he migrates. Without his songs, our August forest would be almost silent. Even late in the month, eastern wood-pewees call from all directions, not only a clearer, crisper “pee-a-wee” but also a more urgent “wee-oo” over and over. Perhaps because this bird is more easily heard than seen and its private life even more difficult to observe, most studies of eastern wood-pewees emphasize their songs and calls. However, it is in the predawn and evening that the eastern wood-pewee’s song takes on more complexity as Donald Kroodsma proved in his ground-breaking The Singing Life of Birds. Having read numerous descriptions of these songs, he was in place with his recording equipment near a large silver maple tree, which he knew was a song perch for a pewee, an hour before sunrise. Already the bird was tuning up a series of “pee-ah-wee” songs followed by a single “wee-oo.” Then he twittered overhead, announcing he had arrived and was ready for his predawn concert. He uttered a single “pee-ah-wee,” then an “ah-di-dee” and in a frenzy of singing he delivered 10 songs in 20 seconds, at the rate of one every two seconds or 30 a minute. Unlike many birds, the pewee’s virtuoso performance has been programmed in his genes and thus he does not have to learn his songs from an adult. For that reason, eastern wood-pewees have no regional learned dialects so their songs remain the same throughout their breeding range of central and eastern North America as far north as the Maritime Provinces of Canada, west to southern Manitoba, and south to northern Florida and southeast Texas. The eastern wood-pewee (Contopus virens) is a dull-colored flycatcher that looks almost exactly like its sibling species the western wood-pewee (Contopus sordidulus). Only its unique song distinguishes it from the harsh, buzzy “peer” of the western wood-pewee. 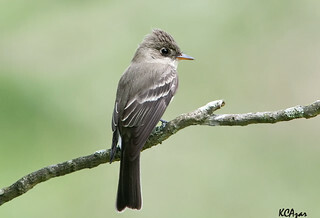 Here in the eastern United States, the eastern wood-pewee is most closely related to the larger olive-sided flycatcher (Contopus borealis), but it also resembles the smaller Empidonax flycatchers, most notably the least and Acadian flycatchers, as well as the eastern phoebe (Sayornis phoebe). However, the eastern wood-pewee does not flick its tail like a phoebe. It is also larger than the least and Acadian flycatchers, lacks their white eyerings, and possesses longer and more pointed wings. But it has a triangular-shaped head, unlike the other flycatchers. Otherwise, its back, head and wings are dark, grayish olive, and it has pale wingbars, whitish or pale yellow underparts, a dull white throat, and a bill with a black upper mandible and a dull orange lower mandible. Like all flycatchers, it sits upright on a branch in the middle canopy, sallies forth after flying insects, snaps one up, and returns to its perch. 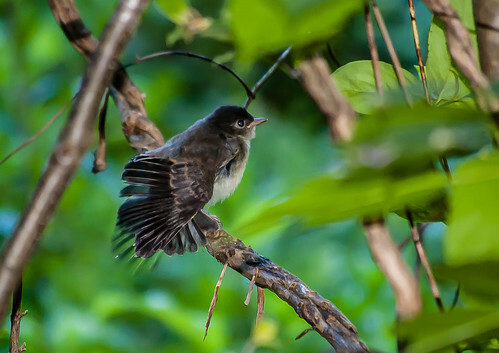 In our woods, the great crested flycatcher uses a higher perch than the eastern wood-pewee while the Acadian flycatcher and then the least flycatcher are perched below the pewee. Of course, it would be rare to find all of them hawking insects in the same vicinity, even though the eastern wood-pewee seems to be a generalist as far as habitat is concerned, using both edge and suburban habitats, open, wooded riparian and/or drier areas, eastern deciduous forest, orchards, open pine woodlands in the South, and mixed hardwood-conifer northern forest. In Pennsylvania we “have a high proportion of the species’ North American population,” according to the Second Atlas of Breeding Birds in Pennsylvania. 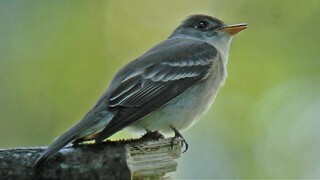 The eastern wood-pewee was found in 88% of the breeding blocks but was “absent from some higher elevation blocks in densely forested northern mountains” and also largely ‘absent from the large and treeless expanses in the Piedmont Province” and tends to avoid our areas of coniferous forest. Altogether, though, ornithologists estimate that we have 315,000 singing males during the breeding season. Eastern wood-pewees are one of the latest migrants to arrive here, probably in part because they spend their winters in South America from northwestern Colombia and northeastern Venezuela to southern Peru, northern Bolivia and Amazonian Brazil. Whether they are day or night time migrants is still debatable, but Mike Lanzone, who has been studying the songs of nocturnal migrants, says that they are mainly nocturnal. “Evidence is very strong simply from the fact that they show up in good numbers at dawn where they were not the day before. [Also] I have heard them predawn with other nocturnal migrants, not singing but making their tanager-like “chip” call,” Lanzone says. Other researchers have found that they are killed at television towers at night. Usually, I hear the first eastern wood-pewee the first week in May and by the second week, when I am participating in the North American Migration Count, I record as many as five singing males on our property. 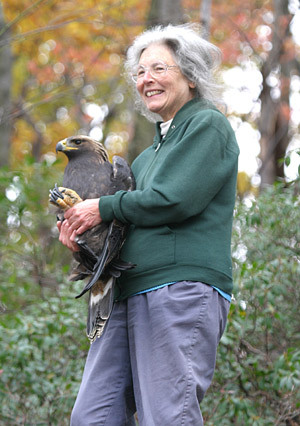 Apparently, they need territories anywhere from five and a half acres to 19 acres in size, which they defend by chasing off at least 17 songbird species while singing. They also may change their singing patterns by not singing when other species or their own are singing. On the other hand, they don’t mind sharing their territories with least and great crested flycatchers. Males do chase females and feed them during courtship, but so far there has been no detailed description of courtship or mating. 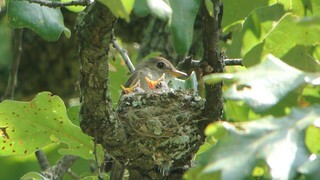 Roy Ickes, writing in the Atlas of Breeding Birds in Pennsylvania, reported that the first nest-building was recorded on May 20, with parents carrying food for their young from June 3 until September 4. 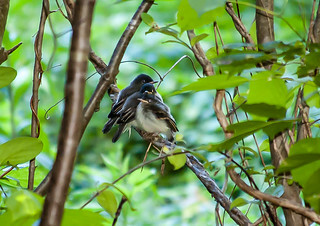 Back on August 28, 2011, I watched an eastern wood-pewee feeding two hollering fledglings on a tree branch. The female lays 2 to 4 white eggs speckled with brown to purple on the large end on consecutive days, and she alone has a brood patch. The male feeds her while she incubates the eggs and may watch the nest when she leaves it. On average it takes 12 days before the altricial young hatch, but Samuel Dickey reported that the incubation period of the six nests he watched was 13 days. Even though observers in Pennsylvania mentioned seeing parents carrying food to nestlings as late as September 4, at least some eastern wood-pewees are on their solitary way south as early as the last week in August and as late as the second week in October. I’ve heard them singing here as late as September 12, but these are birds that even sing on their wintering grounds. Breeding Bird Survey data from 1966 to 2009 showed a 1.7% overall population decline per year, mostly in the central United States. But here in Pennsylvania there was in increase in population. I can only hope that their numbers will remain high and that I will continue to hear their drawn-out laments on hot August days.